StampOwl's Studio: Have a Blast! Apparently another day on the Days of the Year Calendar is Moon and Space Exploration Day, so for our challenge this week Maryann has asked us to use this theme to inspire our card. I remember 48 years ago when I was in grade 9 going to school one day ... it was July 21st for us as it was my sister's birthday. As soon as we got to school we were told to go home as something exciting had happened .... man had finally walked on the moon. So off we went home to watch this exciting event on tv. 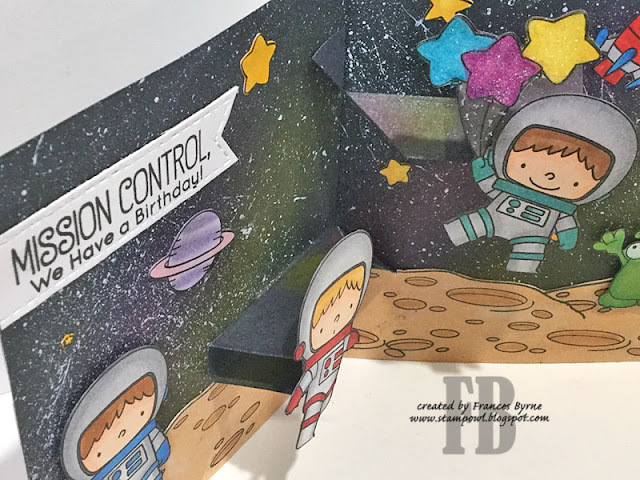 This is actually my third space themed card I have created for a CCEE challenge this year (one didn't have to be space but it was what I ended up creating) .... so I decided I needed a new stamp set to play with this time! 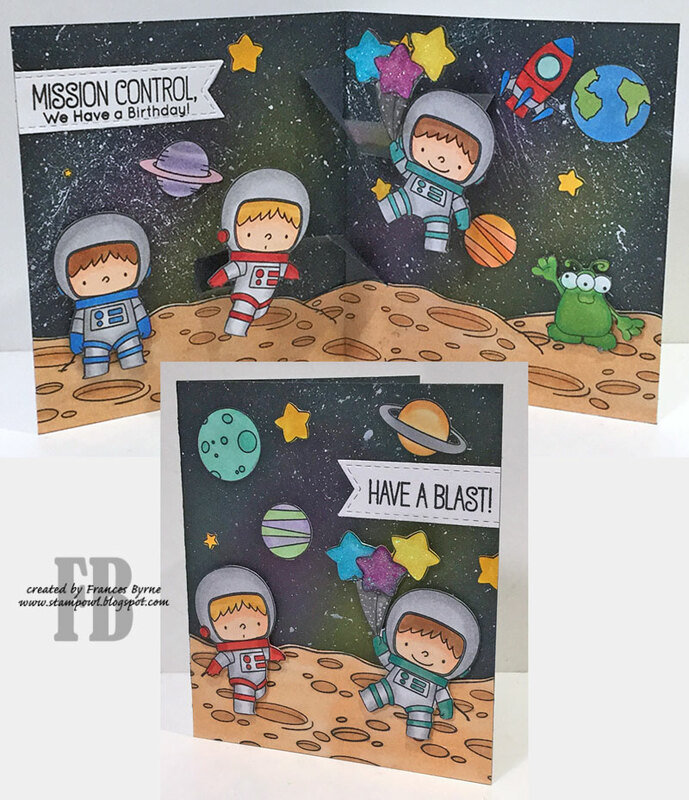 I have used MFT Stamps Space Explorers stamp set as well as my trusty There She Goes Out of this World Stamp set. 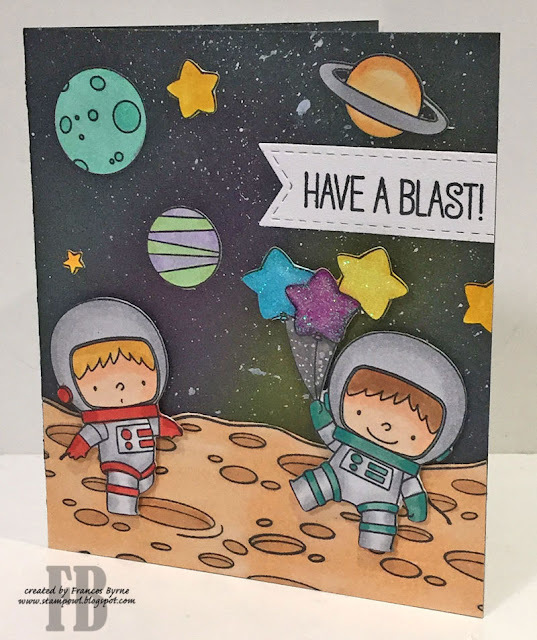 For the background of my card I have again used the galaxy technique to create my starry sky. For the inside of my card I have used the pivot arm from Karen Burniston's Katherine Label Pop-Up die set on either side of the fold so that two of my space explorers can pop up on the card. I love that I can include two pop ups instead of the normal one. Here is a quick video to see my card in action! 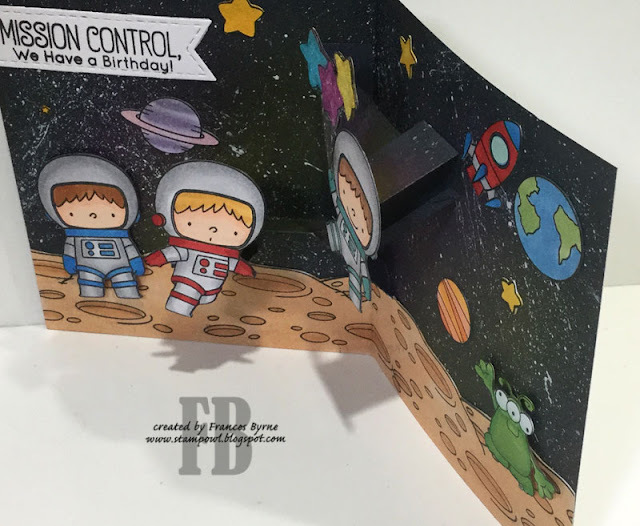 Here is a close up of my card so you can see the pop up panel a little better. And finally one more close up again to help you see the pop up panel on the card. How awesome is this, Frances!! I love your little space-travelers defying gravity!! Remarkable craftsmanship on this sensational design!! Your space guys are just the cutest, Frances, and I'm so glad you added the fun space monster!! As a lover of interactive cards, I am always amazed at your creativity. 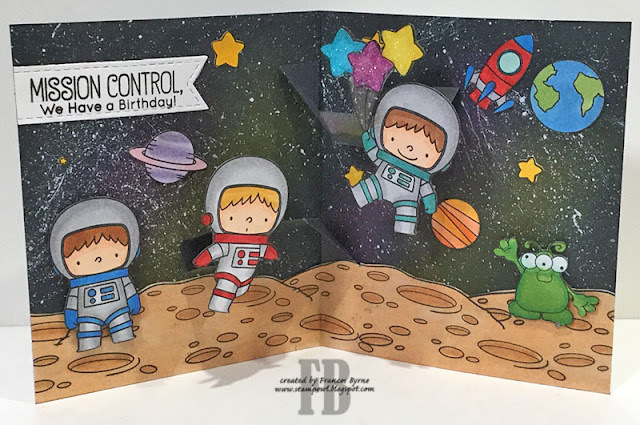 This is such a cute, cute card with the "floating" astronauts! Such an awesome card - and the video is great. Love seeing those astronauts raised up like that! You are the Queen of interactive cards, Frances! This is beyond adorable!